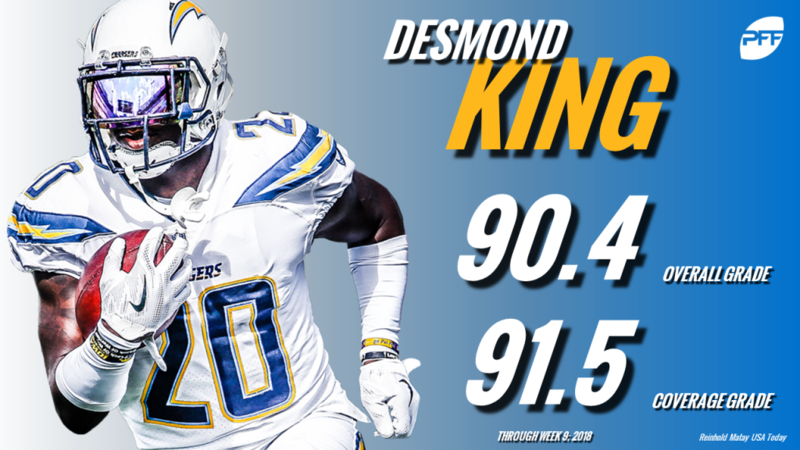 The Los Angeles Chargers once again have the highest-graded cornerback in the NFL, but this year, its second-year corner Desmond King. The former Iowa standout did not take long to make a name for himself in his rookie year, and he has taken his game another step further in 2018. He is now the highest-graded corner in the NFL with a 90.4 season grade. After struggling through the first portion of the season, earning a 66.9 season grade through Weeks 1 to 5, King has revamped his season with a 93.8 grade in his last three games following Sunday’s matchup against the Seattle Seahawks, where he earned the third-highest game grade of his career (92.1). King has secured three interceptions this season, good enough to tie for third in the league. His level of consistent production is solidifying himself as one of the steals of the 2017 NFL Draft. This will be the youngster’s second-straight year in the top-10 after a 2017 campaign where he ranked ninth with an 85.7 season grade. One of the most prominent reasons for Los Angeles’ third-ranked coverage unit is King’s number-one ranked coverage grade (91.5) this season. King has done a majority of his work in the secondary covering the slot, as he has the eighth-most slot coverage snaps in the league (219). He has yet to allow a touchdown and has also snagged all three of his interceptions when covering the slot. Opposing quarterbacks have a 53.4 passer rating when throwing into his slot coverage, the fourth-best mark in the league. If there is one area where King has struggled this season, it is his tackling efficiency. He has already matched his 2017 missed tackle total of seven. This could be caused by King’s enhanced role in the defense, as he is on pace for 74 targets, which towers over his 2017 total of 59. Although King has burst into the top-class of NFL defenders, his cover skills aren’t the only reason for that. King is tied for eighth in the league in pass-rush productivity (16.7). The Chargers’ defense is quickly figuring out ways to be effective even without star edge defender Joey Bosa. King plays next to some of the top defenders in the league, including cornerback Casey Hayward, pass-rushing extraordinaire Melvin Ingram and Defensive Rookie of the Year candidate Derwin James. The emergence of King makes Los Angeles’ defense that much better and will continue to be identified as a steal for the Chargers.